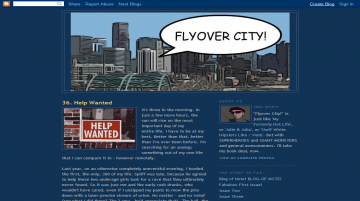 Muse's Success » Web Fiction Listings » Flyover City! Denver, Colorado is known for many things: it’s a growing, thriving mid-sized city with a vital arts community and music scene. There are some pretty good restaurants if you know where to look, and the rents are (relatively) cheap. What Denver doesn’t have is the world (and sometimes galaxy) at-stake, super-hero daring-do that happens in the bigger cities along the East and West Coasts. Flyover City! is the weblog of Joel Wyatt, a regular guy just trying to get by in a super-powered world. Flyover City! has not been tagged yet. Help others find Flyover City! by tagging it! Flyover City! has not been reviewed yet. Flyover City! has not been recommended yet.